We're hit with a look at yet another upcoming colorway of the popular SB Zoom Stefan Janoski. It seems like every other day an all new colorway of the SB Zoom Stefan Janoski is surfacing on the web. Just as impressive as the recently revealed colorways, we have this upcoming pair making use of a brown-based color scheme. Just like most pairs of the SB Zoom Stefan Janoski in the past, this upcoming release makes use of a predominantly suede upper. 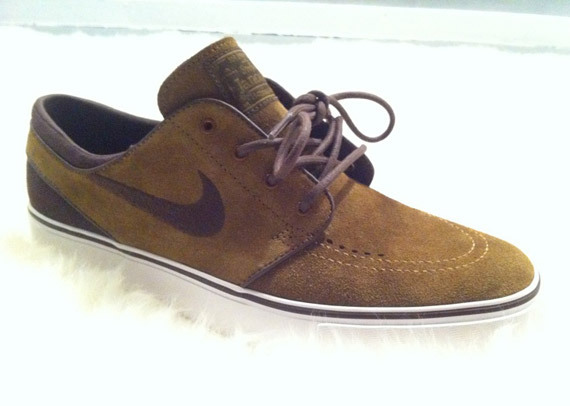 A clean shade of brown covers the suede upper, with a darker shade taking care of the Swoosh, lining and ankle area. Additionally, a white vulcanized sole is seen completing the look below. No word on a release date just yet, keep it locked to Sole Collector for the latest on their official release.